You may recall that I am currently running a Marathon Sock KAL over in my Ravelry group (you can find out about it here). Well, when the KAL started, a few people asked whether WIPs (works-in-progress) were allowed. While I decided that they wouldn't be allowed for the main KAL, I did decide that they would be allowed for a separate warm-up thread to encourage people to get some socks finished before casting on their marathon socks. Handily this also acted as an encouragement for me to get some socks finished. First I decided to finish my 'Starlight Express' socks. 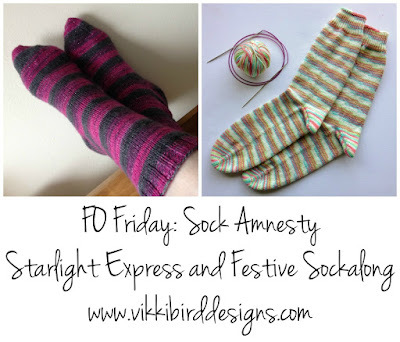 I started these socks somewhere near the start of the year, and nicknamed them Starlight Express after the very sparkly, very 80s appropriate stripey yarn (which I bought at the British Wool Show last year). I had planned to knit these using the Vanilla is the New Black pattern, but I reached the heel section while I was on the train to Edinburgh Yarn Festival in March, and working a new heel is not conducive to relaxed train or sociable knitting, so I carried on knitting a tube ready to add afterthought heels at the end. The finished socks are lovely to wear though. Having knitted a lot of socks I now know that I like my sock yarn to be that bit grippier, so this commercial Opal sock yarn is perfect. I also think this may be the first pair of sparkly socks I have kept for myself! Every other pair has been gifted to someone else. The second pair of socks I finished for the warm-up portion of the Marathon sock KAL is the socks I cast on in November for the Festive Socklong that was being run by Amy from the Stranded Podcast. When I went to hunt these out I wasn't sure how much I had knitted, and was pleasantly surprised to find that I had knitted the whole of the first sock, so just needed to knit the second to match. Having looked through my notes on Ravelry and in my phone (the two default places for writing notes about how I knitted socks) and coming up with nothing helpful, I had to examine the first sock carefully to establish how I knitted it. It turns out I had knitted the sock from the toe-up, with a Fish Lips Kiss heel, which was easy enough to replicate. I did fail on getting the socks to match fully as I didn't take into account that the yarn had two sections in the same colour on each colour repeat, oops. Not that it matters - the two socks have come out remarkably similar! One small thing I did on these socks that I do quite a lot with yarn that has pooled into stripes is to work the heel from the opposite end of the ball of yarn. This means you can work the heel without disrupting the striping, and I find it a pleasing fix. While I could put these socks into a box and save them for Christmas-time, I've put them in my regular sock drawer as I think they're pretty subtly festive. I'm looking forward to wearing these ones.